A camera is basically a boxlike chamber that allows only a tiny amount of light inside at a precise time. Once the light penetrates the chamber, it can form an image. If there is photographic film inside the camera, the light will trigger a chemical reaction on the paper. In a digital camera, the light strikes a photocell to create the image. 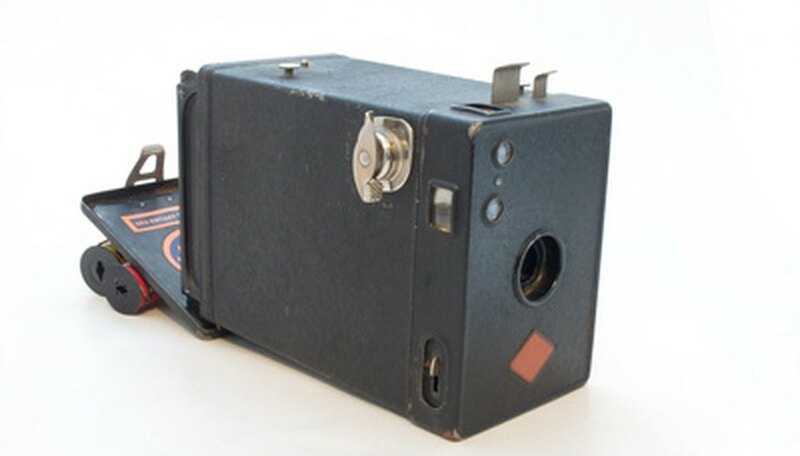 In order to make an old-fashioned camera, you need to create the chamber and also the mechanism to control when and how much light is allowed inside the chamber. Paint both the inside and the outside of the coffee can and the lid black. Allow to dry. Make sure no paint has chipped or peeled off, or light will seep into the camera and destroy the pictures. Use the scissors to punch a hole in the center of the bottom of the camera. The hole should have a 1/4-inch diameter. Rotate the scissors to widen the hole. Cut a square of heavy black paper that will cover the hole you made at the bottom of the can. Use the needle to make a pinhole in the center of the black paper. Push the needle only halfway up the length of its shank. Rotate the needle as you push it through the paper so that the hole is round and smooth. Tape the black square paper with the pinhole over the 1/4-inch hole at the inside bottom of the can. Make sure the pinhole lines up with the bigger hole so that you can see though the can. Look through the back of the camera through the pinhole to make sure it is round. Aim the camera at a page with words. You should be able to see letters. Cut another square of black paper that is big enough to cover the pinhole. This is your shutter. Tape the shutter over the pinhole on the outside the can. It should form a hinge that you can open and shut. Put a small piece of tape on the bottom of the shutter. You should be able to tape the shutter closed after taking a picture. Go to a room with a safelight or no light to load the camera with the fast photographic paper. Use a closet. Make sure lights in adjoining rooms are turned off. Cut a 2 1/4-by-3 1/4-inch piece of photographic paper in the dark room. Find the side of the paper with the emulsion. It should be shiny. You can also lick your finger and touch the edge of the paper. If it is sticky, that is the emulsion. Tape the four corners of the paper with the emulsion face-up to the inside of the end of the camera opposite the pinhole, which is the lid. Put the lid on the camera to close it. Take your camera into a sunlit area. Find a place to put the camera that is still and fixed. Mold the clay around one side of the camera to form a base and keep the camera from moving. Lift the shutter when you are ready to take a picture. Keep the pinhole uncovered for about two minutes. Unlike film, which takes one to two seconds for exposure, photographic paper takes longer because it is less sensitive to light. Cover the pinhole with the shutter after exposure. Load the camera again and repeat the above step, but slightly change the exposure time. You may need experiment and vary exposure times to get the best picture. Yes Mag: How Does a Camera Work?